Lightspeed BrokerConnect is currently not functional. Please use the Lightspeed CSV import method instead. This import is only for trade history from Nov 5, 2014 and onward. For trade history prior to Nov 5, 2014, please use the Apex Clearing CSV import method. 1. Make sure you have selected the Lightspeed import filter for your account - See: Selecting a Broker Import Filter. 2. Run TradeLog and click on the Lightspeed Imp button. 3. A popup dialog box will ask whether you want to import using brokerConnect or to import from the Web. Click YES to import using brokerConnect. Note: If you already selected a default method of importing when creating your file, this box will not appear. Please move on to the next step. 4. 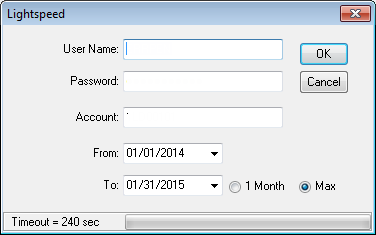 A popup dialog box allows you to enter your User Name, Password, and Account number. The From date pick box shows the from date that will be used for this import. You can use the default date or if you want to import starting from a specific date you can select the date from the drop down calendar. The default import date range is Max. However, if you want to import one month at a time, select the 1 Month radio button. Clicking on the Timeout button allows you to increase the time TradeLog will wait for a response. This may be necessary if you have a slow internet connection. This information gets encrypted and is stored in your TradeLog data file. It only needs to be entered once for each brokerage account. The next time you click the Lighspeed Imp button your information will be displayed in the box and you simply click the OK button to continue. 5. Click OK and TradeLog will connect to the Lightspeed web site to get your most current trade information. 6. All of your trades will be imported and matched.